Long irons are hard to hit right? I started playing left handed and you can see the video here. I couldn't play with an iron longer than 6 iron - NOT A CHANCE. But I got myself a 4 hybrid and boom, that changed. Did you know once upon a time golf iron sets had 3 and 4 irons? Those days are long gone and hybrids have taken their place which is a very good thing. You'll struggle to find sets with 3, 4 and even 5 irons these days. Hybrids are that much easier to hit in the air that even the pros have switched out their 2 and 3 irons in favor of them. Even Tiger started playing a driving iron during his comeback rounds in the Bahamas. The benefit to your game as a higher handicapper is two-fold. You'll be able to hit more par 3's in one shot and you'll be able to hit longer approaches into the greens more easily. 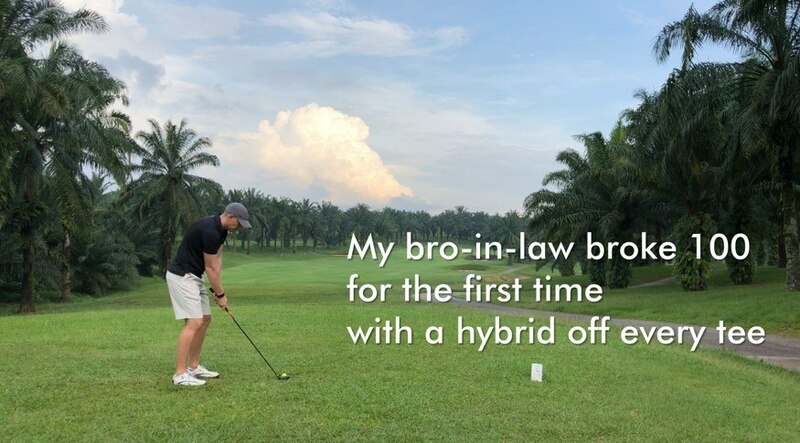 Actually, we could add that one of the best hybrids for high handicappers might become your go-to club for any tee shot. Why are hybrids so much easier to hit? First thing you notice in a hybrid is the body behind the face like Jennifer Lopez before she got old. With that extra booty in the back, the face can be made thinner like a fairway wood. This means the manufacturer can redistribute weight to the sole to get more of the weight under and behind the ball so you can hit it in the air MUCH easier than ever before. See, long irons are thin and look like butter knives. Most of the time, we think we need to 'help' the ball get in the air because the faces are so flat. The hybrid solves this problem and hitting the hybrid like you would hit your 7 iron is ideal! Essentially you're getting a shorter shafted, higher lofted fairway wood that is easier to hit than a fairway wood and far easier to control. In today's game, they're no-brainers and if you don't have one, you're really losing out. The graphite shaft also makes them lighter so you can easily generate enough clubhead speed which is essential to lift a ball off the ground with a lower lofted club. Long irons (3-4-5) need a bit of clubhead speed to get airborne and really are best suited to mid to low handicappers. How do I select the correct loft for my set? Hybrids generally go a bit further than irons of the same loft. The manufacturers generally put the number of the iron on the hybrid to show which iron it replaces. So a 5 hybrid replaces a 5 iron. 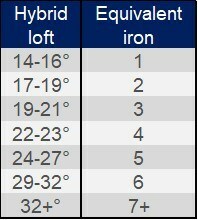 Below is a chart to gauge which loft hybrid golf club to get in relation to your longest iron. Cobra continue to make even better clubs that benefit the average golfer every year. The Baffler rails under this hybrid have been used by them in the past and actually, surprisingly, do work. They run parallel to each other on the sole and are intended to glide through turf so you don't get those shots where you hit it a little fat and the iron digs into the ground, leaving a major duff. This is great news not only for tee shots, but also the trickiest part of hybrids, hitting them off the fairways. The Speedback is easy from the fairway and is a perfect substitute for using an iron out of the long stuff as it glides through the tall grass instead of getting caught like an iron does. 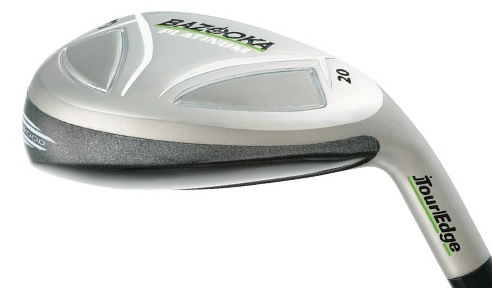 You can literally replace your whole set of irons with the range of Bazooka Platinum Iron woods. They range from 18 degrees all the way to 50 degrees! Tour Edge are famous for making maximum game improvement solutions especially in the fairway wood and hybrid department. These hybrids promote a high longer and soft landing ball but without the need to dig yourself a deep divot like a pro. If you struggle with arthritic hands and prefer sweeping the ball, you'll love these. One drawback is that the head shape stays pretty uniform throughout so the shorter hybrids are quite bulbous so that's something to keep in mind. It doesn't affect the ability to hit your shot, just looks a bit weird. You'll find the Bazookas get great distance on all shots even mishits from thin to fat to off center and slicing and hooking the ball is going to be difficult because these just want to go straight. Cobra have made this thing very light but placed an internal weight pad low and in the back toward the heel to promote a higher launch and straighter flight. Off the tee, you'll find this one very accurate and forgiving, letting you start going for longer par 4's in two shots. The best part about these bad boys is they come in so many lofts. You can get 19, 22, 25, 28 and 31 degree hybrids which pretty much replaces everything from 3 iron down to 6 or 7 irons! Looking down at this club is not distracting at all and the Cobra logo simply painted on the top of the crown makes it easy to line the ball up to the sweet spot and with minimal decal and lines on the face, it looks classic and not full of gimicks. A real simple point and shoot. This could end up being your go-to club off the tee on tight holes. By making the club in general lighter, you're able to make faster swings with the same amount of effort. If you want to feel like you nailed every shot, this is the club for you. It's almost impossible to tell the difference between a good strike and a bad strike. With a selection of 17°, 20° and 23°, there's a forgiving and easy to hit solution for you. A 20 or 23 degree would be best for a high handicapper. The crown of the C300 is quite large and a beautiful matte red satin finish makes you feel confident standing over the ball that there's a lot of club face there to put a good lick on the ball. Low spin rates mean this hybrid hits the ball straighter and on mishits, and with the super flexy face you get mishits almost as long as clean strikes. The specially designed sole with special holes placed around it makes the face flex even more than usual which generates much faster ball speeds at impact. Remember, this is a higher handicapper hybrid so you can expect it to be a low spinning hybrid which it is. That means longer shots with more rollout and less back-spin to hold greens but if you play for the extra roll, you're going to love this club. You can adjust the lofts at the hosel like on the big name hybrids so by turning the adapter in the hosel, you can go up and down two degrees for more loft or less loft. If you hit the ball a bit toward the heel, this is the perfect hybrid for you. That's where they've set the large sweet spot on the M2 Rescue from 2016. I haven't put the 2017 edition in this list because there's no need to spend the money on a product so indistinguishable from the previous model. This model goes from 3 iron down to 6 iron so it covers the full range of lofts needed if you struggle with long and mid irons! The M2 2016 produces a penetrating flight and give you a lot of rollout. What this little club will do is give you that extra oomph to hit those long par 3's that seem to catch you out. On top of the extra distance, the club is a bit draw biased so it helps to eliminate those slices. If you have a faster swing speed, you'll get the most out of these clubs. The sweet spot feels a bit smaller than other hybrids but overall this is a moderately forgiving hybrid in the game improvement category of clubs. One major drawback is the sound of the club. Unfortunately while making the face flex more for big distance, by putting in a slot between the face and the rest of the club, the sound just doesn't match the strike and is very muted. If that doesn't bother you and you just want the boom boom, this is a winner. The HB (Hi Bore) irons are the new Super Game Improvement clubs from Cleveland designed to help beginners and high handicappers hit more consistent shots with ease. We're talking straight to the target and way up in the air. They're almost impossible to mishit. I'm a huge fan of fairway woods for low to mid to high handicappers. They glide through the long grass, get you onto greens from longer distances and can take the place of a driver. But I always find a nagging difference between my 4 wood and my irons. That's where the hybrids come in to save the day. If you have a 5 wood and a 7 wood, you probably don't hit your 4 or 5 iron too much and when you do it's not performing as you'd like. Hybrids are a complement and not a replacement for fairway woods. They can bridge the gap between your fairway woods and your irons or they can take the place of your irons. There is no magic recipe so look at your distances and your priorities to have a bag with both fairway woods and hybrids to give you an all-round solid game. There are tons of hybrids available from full sets to just the replacements for long irons. Either way you can get your game into perfect shape by incorporating a hybrid or three into your bag. The Bazookas are a very good way to get into hybrids as a new player and as you get better, upgrade to bigger brands (if you really even need to). I was wondering if you might help me decide? I’m leaning towards 3 of the Hybrids you recommend here. The Tour Edge Bazooka Platinum, the​Wilson Staff C300, or the COBRA F7. I can’t really find the F7 as of of yesterday. Is the F8 good as well. I’m looking for easy to hit straight with distance in the fairways and possibly a go to club off the tee. Cobra F-Max is even easier!